James Bond has never really had a sidekick. Unless you count his car. From the very beginning, when Dr. No debuted in 1962, 007 has battled the baddies in a ride that stands out from all others in the movie. As it turns out, the car Bond drives also drives box office sales, and this infographic shows that Bond movies tend to make more money when he's behind the wheel of something British, such as an Aston Martin or a Lotus. American and Japanese marques trailing in distant second and third positions. Bond only allowed himself to be caught dead driving a French car a handful of times, to the tune of utter failure. The pride of MI6 is a man of her majesty's realm, and mixing him with liberty, fraternity, and equality curdled his mojo like a particularly stinky French cheese left in the sun for too long. Take that Renault 11 Roger Moore drove in A View to a Kill in 1985. A crappy Renault did nothing to help an equally crappy movie out of the dark hole of crappiness and into the sunshine of commercial success. But realistically, 007's cars have less to do with the Bond franchise's commercial success than how good the movies are. Pierce Brosnan drove BMWs throughout his Bond tenure, and although box office sales slid ever downward, putting him at the tiller of an Aston Marin did little to boost sales. But today's cold-blooded, knee-wrecking (have you seen those jump scenes?! The man's going to be in a veteran's home by the next film) Daniel Craig Bond, together with a fantastic new Aston Martin DBS V12, boosted ticket sales a bit. 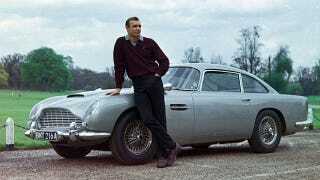 Skyfall comes out this week, and features a Sean Connery-vintage '63 Aston Martin DB5. How that will affect sales is anyone's guess, but we're guessing that awesome Bond flick + rad car = big box office success.